I initially bought the Anker 5-Port USB Charger for my trip to MacWorld/iWorld this year. Up until this point I had kept a power strip next to my bed to charge all my devices at night. Overall that meant having 3 separate chargers on my nightstand. When I was planning my trip to the US, the only real issue I had to deal with was how I’d charge all my gadgets (totally a first world problem, I know). Buying adapters for every single charger definitely was an option but an expensive and ineffective one. That’s when I discovered Anker and their wonderful products. The 5-Port USB charger uses a simple, standard power cord than can easily replaced with a cord that fits the power outlets at your travel destination. It cost me about €3 ($4) to get a cord for this little thing that works in the US. The charger sports 5 standard USB ports for charging and also supports a number of amperages, so it will work with a very wide variety of devices: iPhones, iPads, Samsung Galaxy’s or whatever smartphone you own (as long as it charges via USB). Speaking of amperages. The charger uses intelligent port detection (dubbed PowerIQ) to determine which device was connected in order to provide the ideal amperage for each device (up to 2.4A per port and 8A overall). For example, 1A for an iPhone, 2.1A for a Galaxy S5 and 2.4A for an iPad Air. As you might have guessed, this little charger has replaced all those chargers I was using before. It’s a relatively inexpensive and tiny device, but makes a huge difference on my nightstand. I have been searching for a great, portable bluetooth keyboard for a while now and ended up purchasing the iWerkz Bluetooth Keyboard due to its portability, price, and ability to connect wirelessly to my iPad. 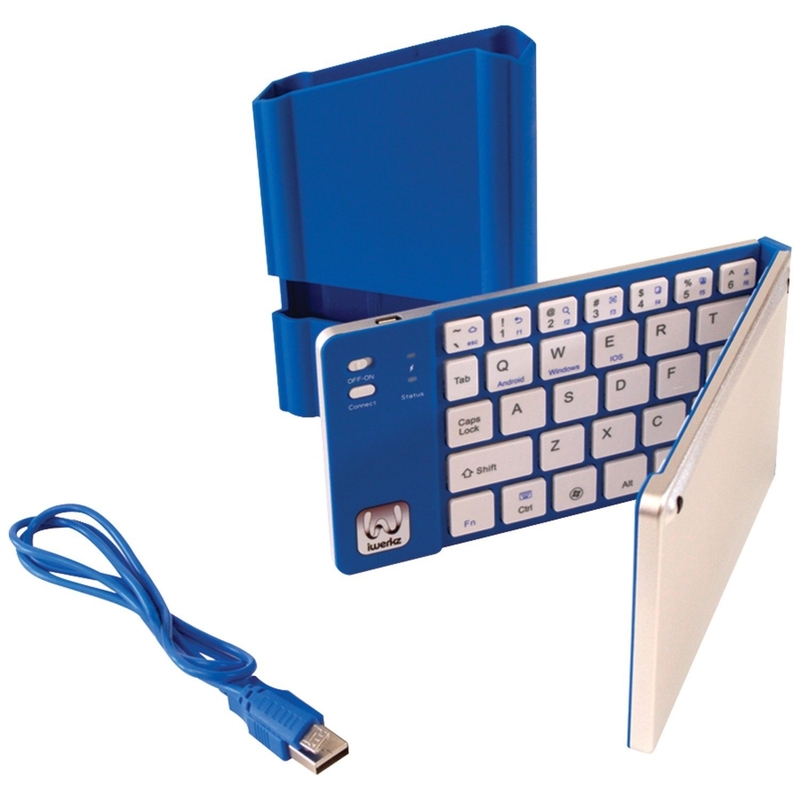 The keyboard folds in half and fits into a small case that doubles as a stand for either an iPad or iPhone as needed. Due to its miniscule size, it is much nicer to travel with than my Logitech K760, with its photovoltaic panel, in my bag. The iWerkz keyboard charges via a microUSB cable that is included with the device. All in all, I love this keyboard and it has made my iPad and iPhone even more powerful when I need to type fast! I have accumulated a fair number of battery/charging devices over time, and so far this is the one I love. It’s compact for a 3200 mAh charger, and square instead of round like the more common “lipstick chargers” advertised. I have a round one…someplace…because it rolled off a table and I don’t know when or where. So yay square! Also it comes in a few different colors (if the orange one pictured above isn’t for you), which is nice. Another advantage is that this will charge an iPad or other larger device. It’s likely not a full charge, but if you need juice for something besides your phone, this will come in handy. It’s got a USB port so you don’t have to worry about built-in cable compatibility, and it charges via micro-USB.